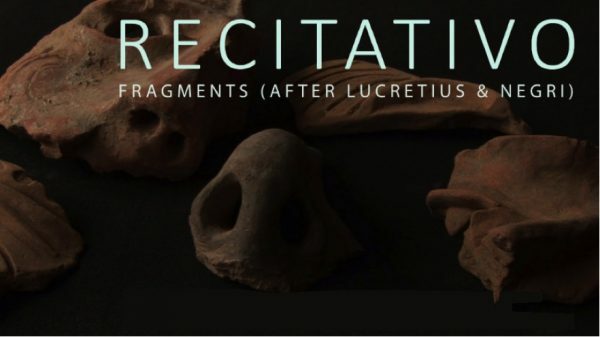 Recitativo – Fragments after Lucretius and Negri is a live performance that examines the relationship between the speaking voice (as a kind of narration) and the possibility of ‘wrapping’ this narration with both sounds and images. Central to this project is the creation of a spoken text that interweaves aphoristic statements from Lucretius’ philosophical and epic poem De Rerum Natura (‘On the Nature of Things’) and, as a contemporary intervention, Antonio Negri’s political reworking of these ideas in the late 1990s and early 2000s. This event takes place at the Stockwell Street building in Greenwich and is held in association with Granular: The Material Properties of Noise exhibition and the Granular Colloquium. Performing: David Ryan, William Crosby, Kelcy Davenport, Cristina Grifone, Justyna Latoch, and Joe Zeitlin. While this is event is free, places must be booked in advance HERE, where booking information for the Granular colloquium is also available. 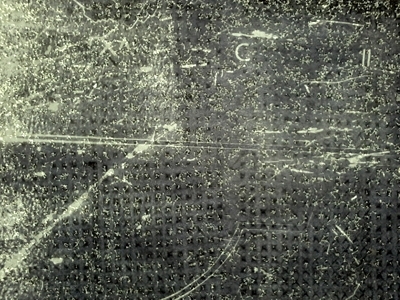 Granular noise is explored as a condition of material transfer . . .